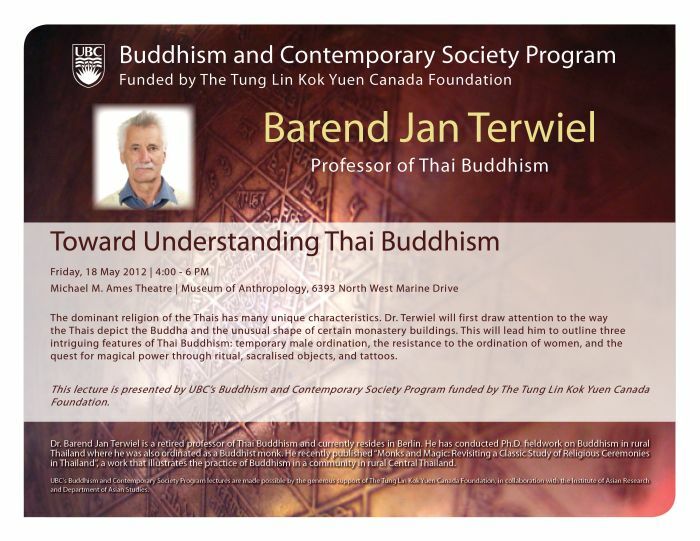 UBC’s Buddhism and Contemporary Society Program presents a lecture by Barend Jan Terwiel. Please click here to download a .pdf poster for printing. The dominant religion of the Thais has many unique characteristics. Dr. Terwiel will first draw attention to the way the Thais depict the Buddha and the unusual shape of certain monastery buildings. This will lead him to outline three intriguing features of Thai Buddhism: temporary male ordination, the resistance to the ordination of women, and the quest for magical power through ritual, sacralised objects, and tattoos. Dr. Barend Jan Terwiel is a retired professor of Thai Buddhism and currently resides in Berlin. He has conducted Ph.D. fieldwork on Buddhism in rural Thailand where he was also ordinated as a Buddhist monk. He recently republished Monks and Magic: Revisiting a Classic Study of Religious Ceremonies in Thailand, a work that illustrates the practice of Buddhism in a community in rural Central Thailand. This lecture is held in collaboration with UBC’s Museum of Anthropology and the Canadian Society for Asian Arts. BCS Program lectures are made possible by the generous support of The Tung Lin Kok Yuen Canada Foundation. Please click here to download a copy of the poster for printing.